Snow climbers have a couple of quick belays for times the consequences of a fall would not be great, as in a sliding pendulum across a snow face. They are useful for belaying a climber who is probing a cornice or crevasse edge, or for providing a top belay to a weaker climber. The boot-axe belay is a fast and easy way to provide protection as a rope team moves up together (fig. 12-36). Despite some naysayers, it has proven to be useful, provided its principal limitation is understood: it can't be expected to hold a high fall force. With thorough practice, you should be able to set up this belay in a couple of seconds with a jab of the ice axe and a quick sweep of the rope. 1. Stamp a firm platform in the snow, big enough for the axe and uphill boot. 2. Jam the ice-axe shaft as deeply as possible into the snow at the rear of the platform, the shaft tilted slightly uphill against a possible fall. Have the pick perpendicular to the fall line, thus applying the broadest side of the shaft against the force of a fall. 3. Stand below the axe, at approximately a right angle to the fall line and facing the side on which the climber's route lies. 4. Plant your uphill boot into the snow against the downhill side of the shaft, bracing it against a downward pull. 5. Plant the downhill boot in a firmly compacted step far enough below the other boot so that the downhill leg is straight, providing a stiff brace. 6. Flip the rope around the axe. The final configuration will have the rope running from the direction of potential load, across the toe of the uphill boot, around the uphill side of the axe, then back across the boot above the instep. bend. The braking hand must never leave the rope. 8. 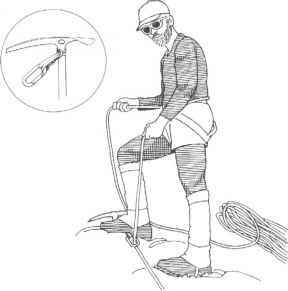 Use the uphill hand for two jobs: to grasp the head of the axe to further brace the shaft and then, as the belayed climber moves upward, to take in rope. Climbers must be equally adept at setting up the boot-axe belay with either foot uphill, because it is essential that the belayer face the climber's fall line. If a lead climber falls behind the belay, the rope unwraps from the axe and there is no belay. Fig. 12-38. Sitting hip belay potential direction of pull up through the carabiner, then around the back of your waist and into your uphill (braking) hand. One nice thing about the carabiner/ice-axe belay: the force of a fall pulls the belayer more firmly into the stance. Other snow belays usually are used with formal anchors, such as flukes, pickets, or bollards. 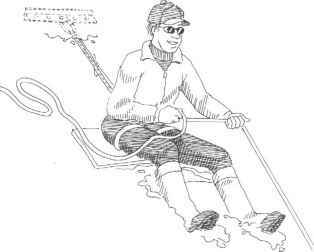 The sitting hip belay, with an anchor, is inherently dynamic and very secure on hard snow or deep, heavy, wet snow (fig. 12-38). The sitting belayer may face the prospect of a cold, wet assignment, and the belay can be difficult to work if the rope is frozen. To set up the belay, stamp or chop a seat in the snow plus a platform to brace each boot against. Put down a pack, ensolite pad, or other material as insulation from the snow, then settle into a standard hip belay, with outstretched, stiffened legs. The standing hip belay is easier to set up than a sitting hip belay, as it needs only deep, secure slots for each boot. However, it is far less secure because the belayer tends to be toppled under the force of a fall. Standing hip belays must be backed up with an anchor. These belays can be arranged so the climber faces into the slope, out from the slope, or sideways. Facing into the slope is the poorest choice because the belayer will be completely wrapped by the rope if the climber falls below the belay stance. And it is difficult to pay out rope for a smooth belay. Facing out is an improvement because it gives a less complete wrap around the belayer and also permits a view of a fall below, important in timing a dynamic belay. But it shares a major weakness with the face-in stance: no way to brace the legs against toppling downhill. In both stances, the belayer should lean into the slope, against a downhill pull. For the most reliable standing hip belay, stand sideways, facing the same side as the climber's route (fig. 12-39). The downhill leg is straight, locked at the knee, and braced in a snow slot. The uphill leg is on a line with the downhill leg and the direction of a potential fall. The downhill hand should be the braking hand to allow best control for a gradual dynamic belay. directly from the anchor rather than from your seat harness, permitting you to get into a drier, more comfortable position. 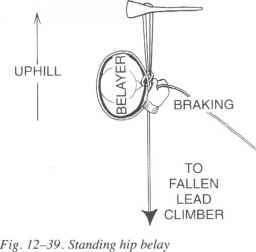 Be aware that belay devices provide a less dynamic belay than a hip belay, increasing the peak force of a fall on questionable snow anchors.